Don’t let anyone tell you hot-rodding is dead! 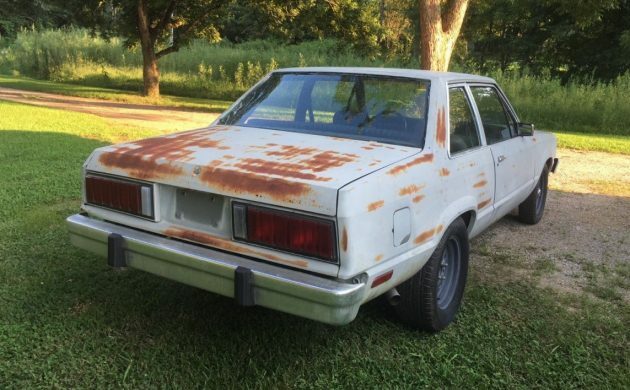 Donated components from a 1991 V8 Mustang transform this 1978 Ford Fairmont from Zero to Hero… on the cheap. That’s what hot-rodding is all about. Simply flip the silly hood scoop into the trash and you’re trolling for victims. This peach of sleeper from Alto, Georgia can be yours with a high bid here on eBay. Like many cars of its era, the ’78 Fairmont emerged from a school of design that prized a single tool… the straight-edged ruler. Ford discussed using square tires and steering wheels but ultimately decided that, alas, some parts must be built with old-fashioned curves. 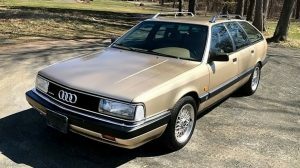 While the available fastback might seem more sporty, this car’s formal two-door sedan styling completes the sleeper persona. Oops – I accidentally included a picture of a ’91 Mustang. But wait; this is the Fairmont… with a Mustang interior. And praise Allah! An honest-to-goodness five-speed manual transmission. The five-speed turns the donor Mustang’s 8.8″ rear axle with 3.73:1 final gears. In a 3000 lb car normally piloted by drivers thinking “Look at me! The Doctor said ‘no’ but here I am on the road!” this tried-and-true powertrain promises to embarrass drivers of much more expensive machinery. 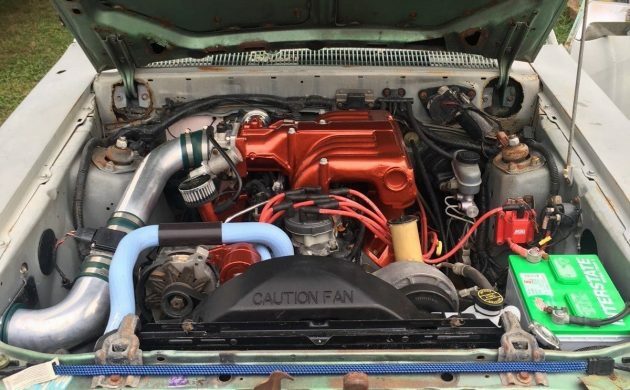 Thanks to the Fox platform it shares with ’79 to ’93 Mustangs, the Fairmont’s engine bay differs little from that of the donor Mustang. Even the shock towers are the same. The sky’s the limit when it comes to modifying the “5.0.” Add a few thousand dollars and this budget box becomes down-right beastly. Who would you victimize if this primer-coated sleeper found itself in your driveway? Throw hood scoop in trash..then get a pizza delivery sign for top. Then beat up until dead. After that..crush.. I love the look of this thing and the drivetrain is easy to work with. Do the hood hinge mountings to the cowl look kinda funny to anyone else?? Hi brettucks. Agreed; those hinge mounts are Hinky with a capital “H.” They look just like a Mustang’s, except sunk in. I suspect some welding would be prudent to avoid watching the hood as it flips over and over in your rear view mirror. As the owner of a 78 Fairmont, those hood hinges are OEM. I have an ’81 Fairmont Durango and while the hinges *are* OEM, them being set back in a hole in the cowl is *NOT*. It’s a stock hood so something is up with the cowl – looks rusted out. While it could be done, I just don’t think you could get this to handle the on the same level with just plug and play. The build quality was tin can terrible. Not sure where Allah comes into this. Maybe say abracadabra or hocus pocus. My Dad had the fancy wagon version (briefly…he rarely kept a car more than 2 years). You could really stuff a lot into that thing. Too bad it didn’t have this one’s drivetrain and chassis mods ! The seller would have been wise to have spent $50 at Home Depot on some satin black cans of spray paint and a roll of blue painters tape. The dash, console and front seats look like they belong, but the crappy primer finish hold the car back. I beg to differ. I believe that having no paint is always better than a cheap paint job. 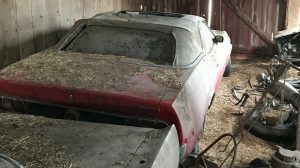 It looks more “honest” that way, and will be a lot less to have to grind/sand – blast off of it when the owner decides to get it properly painted. 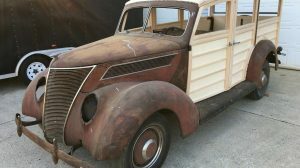 Also, potential buyers won’t have to worry so much about what rust or bondo that could potentially be hidden under that extra layer of paint. Don’t get me wrong, I hate it when people leave cars in primer and think it looks “cool”. 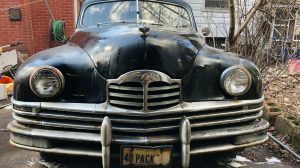 I would just want to restore this car to original the “right” way, including a “real”, professional paint job. As to handling, WA State Patrol and some rural county Sherrifs used these optioned out with FordbPolice packaging. Wider rims, Micheline tires, believe upgraded to Gabriel sshocks, with heavy duty sway bar suspensions. Engines were tuned a tad above mom and pops or kids street 302. F B I also used same upgrades. Bought these w -3 year olds, with between 60- 80,000 miles at auctions for 500- 1000. What they, stock or one modified like this, up to the buyer, and unless the flipper got this dirt cheap and in this shape not much room for next buyer to make a buck. No spare tire???? Trunk looks like the new KIA Souls, no spare tire or jack!!!! No spare tire = more room for your victims. Absolutely right. This trunk looks better than a HyunKia or any nisfinity, lexota, or hondcura. The ‘straight-edged ruler’ was used for the design phase, assembly required extensive use of gauge blocks. That’s the ‘flat out’ truth. Don’t let anyone say you’re not a straight shooter, Don. Oh no….the back woods of Mississippi pays us an uninvited visit!! Don’t answer the door!!! Kill the lights!!! Maybe it’ll go away!!!!! This concept is interesting, but I don’t believe I could bring myself to purchase such a homely looking thing. As Steve R. said a flat black foo foo can paint job would be an improvement. I’ll pass on this one. If he was keeping it a coat of Flat Black would definately help it, but if I was a potential buyer, I would prefer this. A fresh coat of anything has scared many a buyer away. This one isn’t hiding much, and for a few bucks,and a few hours, the next guy can rattle can it if that’s the look he likes. The “Stang interior looks right at home – personally I’d like to see a sedan or wagon modded this way for added sleeper points, but the coupe is still quite cool. It’s refreshing to see a build that looks more shadetree than fab-shop. Primered/rusty cars do nothing for me. 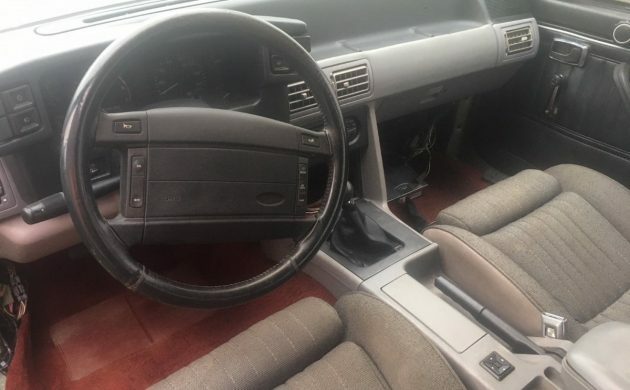 The mis-matched interior only makes it worse. At it’s current bid of $2500, it’s already passed the maximum amount I would pay for it. Of course it’s still at “Reserve Not Met” so who knows what the seller is hoping to get for it. There is a current ask of $2500 with 0 bids. It looks to me that he spent a lot of time and money on a car nobody wants. 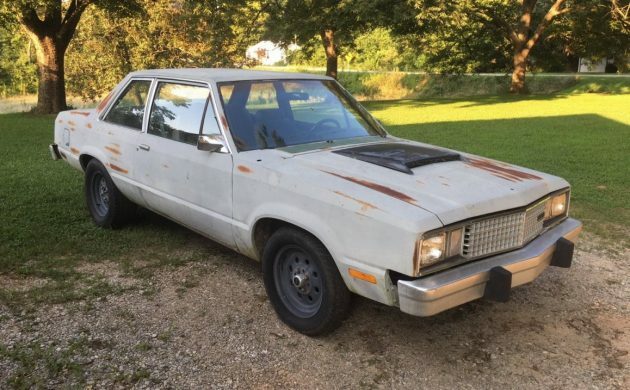 Ask gas Monkey Garage about wasting money on a Fairmont. Regarding the hood hinges- I agree, the firewall appears to have two round holes cut where the hinges mount. The hinges appear to be Fox body parts, so I’m not sure the reason for this modification. I bet this is a fun car to drive. Be the last car I’d expect to smoke the tires. Is it just me or are today’s comments repeating, repeating themselves? I had a stoner living in my dorm at college that had one of these Fairmont coupes in baby blue. The only one I’d ever seen until now. Given this one’s upgrades, if it was painted baby blue the sleeper aspect would truly be complete. This would make a awesome toy for someone! I think that I would have to finish up the interior and paint tho, I am not fond of patina at all! That hood scoop looks like it’s off of an early fox body mustang. I hate these Fairmonts/ Zephyrs in this body style but they do share the same platform as fox body mustangs. I am a big fan of fox body mustangs as we own three plus four other ‘stangs. There’s a guy in town here that would really love this car. He’s decked his Zephyr out with pin stripes, after market fog lights that sit on front bumper and numerous other appearance stuff that doesn’t belong on the car. He thinks it’s bad. He also owns an 07 mustang with tons of pin stripes and carbon fiber tape, etc on it. IMO, ruined both cars. I’d love this. Hilarious tire smoking fun. Agree with losing the hood scoop however. FrankenFairmont! If this were the wagon version, I’d be on it like white on rice. As it is, a paint job, even the flat black from a rattle can, would help. “Patina’ isn’t helping here. Rich, I have never heard of or seen a Fairmont Durango. Had to look it up! What motor you got in her? I’d be concerned with the cowl that needs work. Depending on the reserve could be a sleeper with some work. Nice budget rod!!! You could take it to whatever level you wanted. Why are so many people saying that this car needs to be painted flat black using spray cans? I personally hate the flat black look, it just seems over – done and overrated to me. Plus, I have never, ever seen a car (that wasn’t a 1/16th scale plastic model) that looked good after a spray can “paint job”. They always look like garbage, no matter how much masking tape is involved. I guess I’ve just seen too many interesting cars violated with cruddy spray jobs (usually, but not always, in black). In my opinion, this trend is even worse than the fake/overdone patina thing (though admittedly I do have a soft spot for vehicles with an “honest wear” to their finish). Ah! I am glad to see that I am not alone in this opinion! I had a ’78 Fairmont wagon, pale yellow with the fake wood and a 302. It was a $200 car I bought to move some stuff at the time. I had three Fox Mustangs at the time as well, but you can’t put much in them. I put a set of polished ten hole Mustang wheels with staggered tire sizes, 225 in front and 255 in the back for a raked look. It was weathered and the paint and fake wood was faded, but no rust, went pretty good and wouldn’t die. I have lots of fond memories of that car. The kids hated it, ha ha ha.